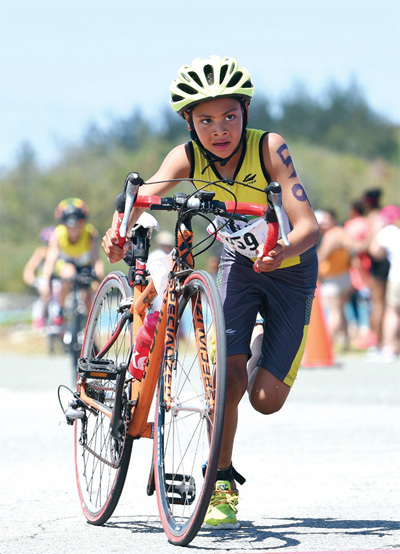 At that time Duffy was one of the youngest members of the fledgling Ber­muda Triathlon Association’s Junior Pro­gramme, and one of her coaches, Neil de ste Croix, who for more than 25 years has been the leading light of junior tri­athlon in Bermuda, will be among those watching her race. 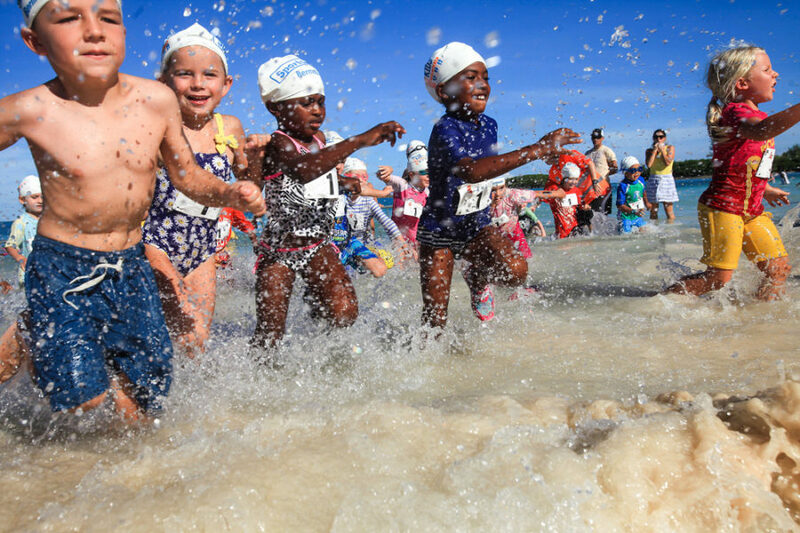 For such a small island Bermuda’s junior triathlon programme has been extraor­dinarily successful in developing junior triathletes to compete at international level, built on a philosophy of “having fun” but also in providing the resources for juniors to succeed in the sport at lo­cal and international level. It all began in 1989 when Steve Petty, Greg Hopkins and Tony Ryan started the Capital G Ironkids Triathlon, which 29 years later in its present form as Clar­ien IronKids, is still attracting more than 150 juniors. Looking to build on this initiative local schoolteacher and tri­athlete Dave Morrison formed a junior training programme of about seven ju­niors, which included Tyler Butterfield, and enlisted the help of Neil de ste Croix and Jeremy Ball. He then set about get­ting junior categories added to local races. The programme expanded rapid­ly to more than 60 juniors and was soon based at Clearwater Beach; which, with its lagoon beach, parkland and mostly traffic free roads was the ideal training base. Morrison spearheaded the pro­gramme til the early 2000’s and later formed another junior club, TRex. Guest coaches, such as world champi­on Karen Smyers , were brought in for camps and in 1996 the programme took a large group of youngsters to compete by invitation in the final of the USA Iron­bread Junior Triathlon Series featuring all of the top regional race winners and televised on ESPN. The group, which included Duffy and Butterfield, took numerous podium positions leaving the organisers with the task of deciding whether an invitation Bermuda squad should be given the medals, which they subsequently were. Since those early days, thanks to the continuing efforts of De Ste Croix , Chris Harkness , Nigel Godfrey and Karen Ma­deiros, and more recently Ian Pilgrim and Chris Smith, the programme, which was renamed the Tri Hedz Club, has continued to provide the opportunity for juniors of all abilities to participate in triathlon. For more than 25 years juniors have been competing both on the local scene and abroad with Tri Hedz, and for a time TRex, notably to leading ju­nior races in Chicago and then to Ma­gog in Canada. Bermuda’s juniors have enjoyed great success at these events, and in the early years sometimes taking home all of the medals in age groups. In addition Easter and summer camps have been organized, including the long running camp run by leading UK coach Steve Trew. A key factor in the success of the pro­gramme has been the availability of good facilities, the proximity of good swim clubs, an active junior road and mountain bike racing scene and numer­ous junior road and track clubs, races and meets. As well as training once or twice a week with the triathlon programme juniors are encouraged to participate in local swim clubs and swim meets, bike rac­ing and running clubs and races. Many believe that this initiative in the early years has had a big impact on the de­velopment of triathletes with the tech­nique, confidence and overall physical development to compete internation­ally. 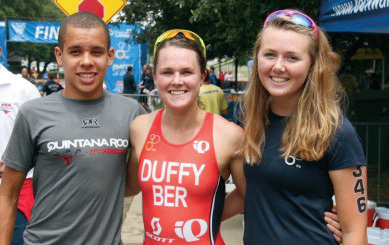 Duffy competed for Bermuda as a swimmer and held a number of nation­al nation­al records, and was one of the island’s leading junior runners. She participat­ed as a swimmer in the Youth Olympics. Butterfield was, for a time, a profession­al cyclist for Garmin Cervelo and was an outstanding junior runner. More recent­ly Tyler Smith finished eleventh in the 2017 World Junior Triathlon Champion­ships but has also in recent years med­alled in the Caribbean Cycling Champi­onships and competed for Bermuda as a swimmer and runner. all three juniors were winning Bermuda national championships whilst still in their early teens. By the start of the new millennium But­terfield and Duffy had emerged as the most talented of these juniors and both of them eventually moved abroad; But­terfield to school in Australia and Duffy to the UK at Kelly College, to work with former leading triathlete Robin Brew. Their determination paid dividends with Butterfield, despite tripping whilst in contention for a gold medal on the finish straight, taking bronze in 2002 at the Junior World Championships in Cancun, and Duffy taking silver in the 2006 Junior World Championships in Lausanne. Adam Smith, Hedges and Herring also represented Bermuda at Junior World Championships. Since then a new generation of juniors have taken inspiration from Butterfield and Duffy. Tyler Smith, who in addition to his performance at the Junior World Championships, was last year a bronze medalist in the Central American and Caribbean Junior Triathlon Champion­ships and finished third in the British Triathlon Championships. He is now enrolled in Leeds University which has a leading elite triathlon pro­gramme. Erica Hawley took silver in the 2016 and 2017 Central American and Caribbean Championships and as a freshman last year at Boulder University won the US Collegiate Triathlon Cham­pionships. More recently Matthew Ol­iveira and Khamari Greaves have also represented Bermuda at the junior worlds. Other young triathletes to watch in­clude Nick Pilgrim and Caleb Ingham, who have been racing in North Ameri­ca, in particular in the competitive USA FI 13-15 Youth Series, with Pilgrim hav­ing achieved a podium this year and Ingham also in contention. Lyndsay Palmer has also emerged as a very good prospect and is competing as a junior elite on the US circuit for the second year, while Jessie Marshall is showing promise in the junior elite ranks. There is also a host of younger juniors making a name from themselves in­cluding Tristan Narraway who placed 3rd at US Nationals in 2014. Blake Ol­iveira who won silver in 2015 and 2016 in Canadian Nationals and Jasmin Has­selkus, who took silver at these champi­onships in 2016, are two younger triath­letes showing huge promise. Above all the junior initiative has brought the enjoyment of triathlon to many juniors but it has also allowed many of them, and a new generation of very talented juniors coming through the ranks, to showcase their talents on a world stage.